I always used to picture myself marrying a handsome Mr. Darcyish stranger that I would meet in some amazing place and stunning way… but now I have met a few Darcy’s. They were exciting at first but ultimately they are exactly blah. The more places I go and the more guys I meet (and trust me, I have met more than a few), the more I realize that I have developed a taste for tough dudes and tough dudes alone. While I’ll be the first to cheer for a good man of considerable wealth (smart businessmen with large fortunes should not be so looked down upon), I can no longer tolerate the image of Darcy. 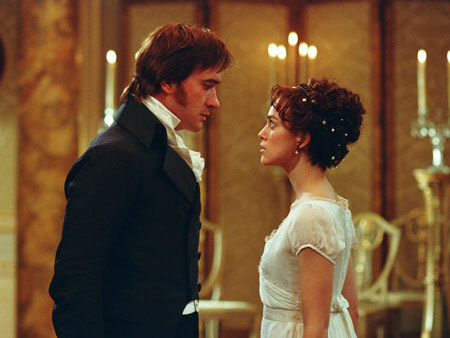 The reason he has become a poor example of perfection in my opinion is because, while he is painted as the ideal man a woman wants, he has no obvious purpose or drive or reason to be alive except to be Darcy. His and Lizzie Bennett’s story is an idealistic and woman-slanted take on the tendency of the heart to eventually love the one whom you most love to hate. A perfect premise for a story. Only here it is all Lizzie calling the shots. Do you see it? Everything is up to her and Darcy wins her through fine manners and spending money to help her family out of a crisis which proves his unchangeable devotion to her. Neither good manners nor helping someone with money is wrong, but these are very slight things to recommend a young man. It all boils down to what Lizzie wants out of life and how he will satisfy her, rather than her wanting to help him with his life’s mission — probably especially because he doesn’t have a life’s mission. This wandering lack of usefulness of the hands and the mind is an affliction I see many young men under today, and it is getting worse. Jane Austen was ahead of her time on the feminization of men. I know I shall be labeled a heretic for saying things against Lizzie and Darcy but there it is. I don’t dislike them as characters but I find I cannot cheer for them as a model of happiness. Before I conclude I must confess that I do have one little tiny personal qualm with Darcy and that is that he never gets grease on his fingers. Probably the only time he sweats at all is when he proposes to the aloof Miss Bennett who can twirl him around her little brown finger. His hands are probably white and soft and I can feel only pity for men who have soft white hands. So I don’t want a Darcy. I publish this little epistle at the risk of being harsh. But these sentiments are in earnest. And, as a parting word, lest I seem prideful or prejudiced against the fictional works of Miss Austen, I will here mention that I find her writings quite thought-provoking. Congratulations on your intuitive understanding of men, you have a gift of wisdom! ‘Fitzwilliam, Out of Favor’ is a correct analyzation of todays societal “man.” I was referred to your site by Grace, and truly enjoy your diatribes! Please keep up the good work! I knew we had something in common… and here I was begining to wonder if I was the only girl alive who didnt like the Darcy, nor his resembled genre. Grease… tough guys…. [nods] Very important. I stumbled upon your site through your post on the rebelution blog. I hadn’t thought of Darcy that way before, but I must admit, you have a very good point. Keep writing! You have God-given talent! Yes, the gentleman should have a purpose in life. But so should the lady. And the relationship should be one where they both help each other achieve those purposes, whatever they are. Right? So props to Lizzie for being a woman with a goal, and props to Darcy for supporting her. And, I’d have to argue, Darcy does have something of a goal: think about his relationship with the people who live in his manor (the maid who shows them around, and says what a wonderful, thoughtful man he has always been; his relationship to his sister, taking on a fatherly role and trying to teach her the ways of the world). He has means, and his purpose is to distribute those means (his money, his education) in a way that helps the most people. So Lizzie helps him with this purpose when she gives him a bit of a kick and gets him off his high horse…now he’s better able to respect those he is working for, and be a better “master of the manor”. Now, all this is not to say that some grease (or sawdust, or dirt, or paint) isn’t part of my ideal guy. It is. I just think there is more to their relationship than you’re giving them credit for. Music is not my life.